Shopping for cruelty-free shoes is not as hard as you might think. There are lots of options at all different price points and you don’t have to sacrifice fashion and looking good in order to wear cruelty-free materials. 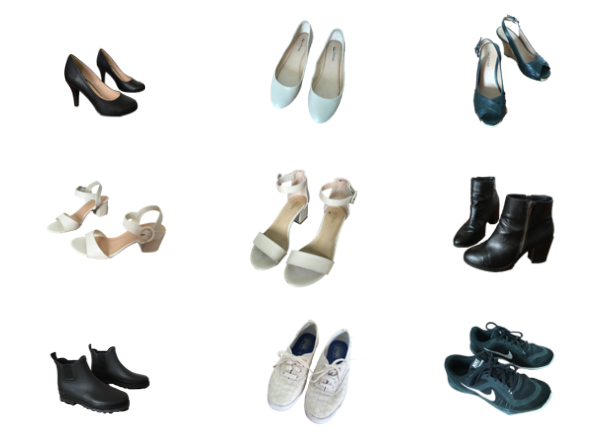 Pictured above is most of my shoe collection that is free from leather, coated leather, suede, fur and silk. 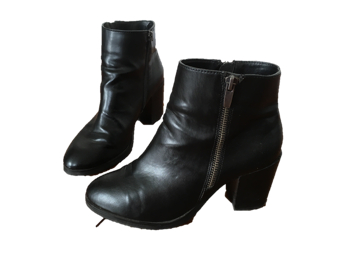 I love shoes and I don’t miss out on having great styles by choosing cruelty-free materials! The best way to confirm the material of shoes is by the sticker placed on the bottom of the sole. These two symbols mean your shoe is made without any animal byproduct materials. If you find a shoe that is leather, you will see a hide symbol on the sticker, which looks similar to a puzzle piece, and this indicates the shoe is made from the hide or skin of an animal. If a shoe is coated leather, the symbol will be a hide shape with a diamond shape inside. I don’t currently have my own picture of these symbols but you can easily find pictures of these symbols on other websites. The brands I mention below are some of my favourite fashion brands and I continually go back to them to get fashionable and cruelty-free shoes. These brands are the most accessible to me but I do want to support more vegan shoe companies in the future so leave me your recommendations in the comments! This brand is one the more affordable options for cruelty-free shoes. The top row pictured above are my current pieces from Call It Spring. The styles at Call It Spring are always trendy and in season. This is one of my favourite places to go for sandals. I think they always have a good selection and I think that sandals are one shoe type that you don’t need to spend a lot of money on. They are a little stiff and it can take a longer time for them to ‘break in’. The pumps pictured above are quite comfortable for that style and are actually comfortable to walk in. I have had successful purchases from Call It Spring so I would recommend them as a great option for cruelty-free shoes. I love supporting Canadian brands and Le Chateau is one my favourite stores for shoes as well as clothes. I think the shoes at le Chateau are a higher quality of shoe and their faux materials have the look of leather without being too stiff. The price point is a little higher but it’s still affordable. The middle row pictured above are from Le Chateau. I think they are a great option for sandals but I also go here for boots. I want to get a new pair for this fall and winter and I’ll be posting about them later! This company is 100% vegan so you can purchase with confidence that there are no animal materials in the shoes. The Chelsea boot pictured above in the bottom left is currently my only pair of Matt and Nat shoes. I purchased these in the Matt and Nat store in Square One, a shopping mall in Mississauga, Ontario. They were on sale when I purchased them and I had to place an order in the store to get the black pair. Matt and Nat is definitely a more expensive option for vegan shoes but I’m okay with spending more for quality when it comes to boots. If I can get them on sale though, I definitely will! These vegan rubber booties are extremely comfortable and perfect for those days when it looks like it’s going to rain but might not or if it’s just a light rain. I love them so much that I wish we got more rainy days! The white sneakers pictured above in the middle of the bottom are my first pair of Keds that I purchased last year. I loved the eyelet pattern but I didn’t do a great job at keeping them white! This may be their last year. I would repurchase them but I would probably go with another pattern and colour. They are very comfortable and great as an everyday casual shoe. If you are shopping for your Keds online, they label their shoes as leather and have a filter option for the leather ones so it is easy to separate the leather and the cruelty-free options. The running shoes pictured above in the bottom right are labelled Nike Training Flex on the shoe. I purchased them last year and they were last years style at that point I think. They were luckily on sale when I purchased them. These are my gym shoes and they have always been very comfortable for working out. I’m not doing any running right now so I can’t say how well they would work for running. I have worn these on trips and walked around in them for a day and they were comfortable the whole day. I like running shoes to be quite plain and I like black because it goes with everything. I’ve been wearing these for about a year and they are still in decent condition so I think I should be able to make them last a while yet.